My husband is handy in the kitchen. He comes up with yummy new recipes. A couple nights ago I got home from work to find him making some delicious kale and strawberry smoothies. I gulped mine down before I had time to take a photo of it for the blog. Next time. Here is his delicious kale salad. We have tons of kale in our garden so we’ll be making this a few times before summer’s end. 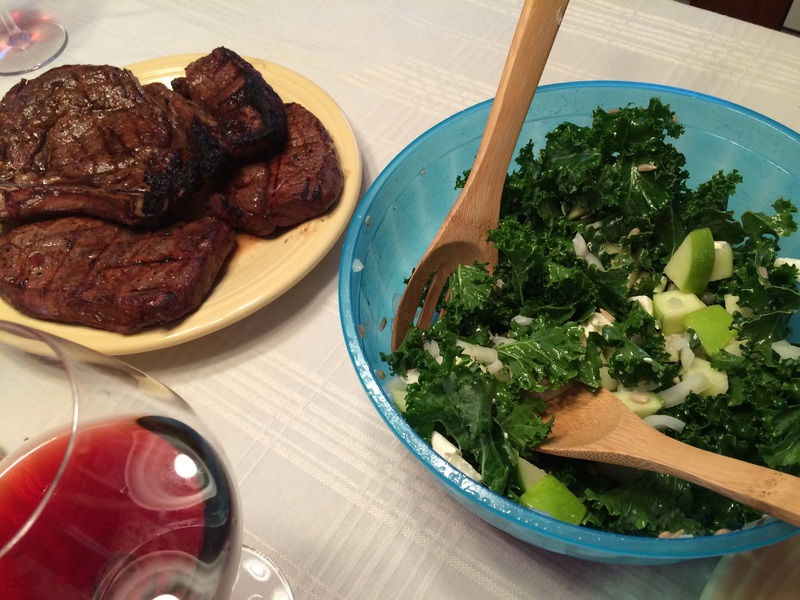 Put together one bunch of kale and one diced green apple. Then add in the following: 2 tablespoons apple cider vinegar, 2 tablespoons lemon juice, and 2 tablespoons olive oil. Next, cut some feta cheese into bite-size pieces. Sprinkle the feta and a handful of sunflower seeds on the salad. You could use walnuts instead if that floats your boat. You can also add a few onions if you like them. We do. This is a delightful side dish, especially next to grilled steak and a glass of pinot noir. 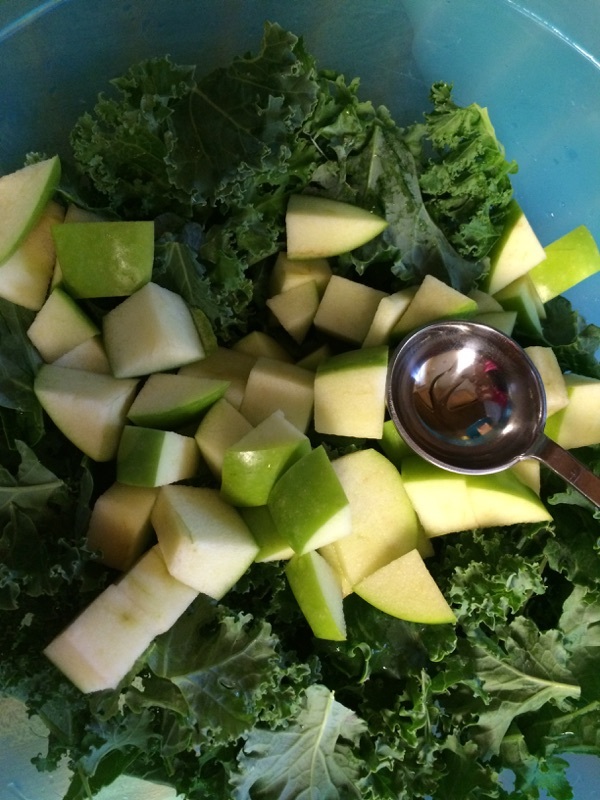 Place one bunch of kale and one diced green apple in a bowl. Add to this 2 tablespoons apple cider vinegar, 2 tablespoons lemon juice, and 2 tablespoons olive oil. 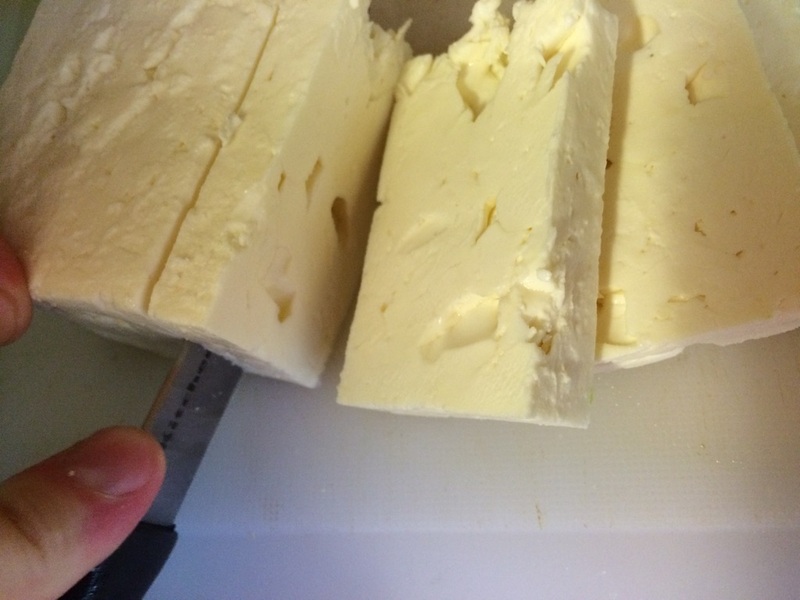 Cut some feta (about half a cup) into bite-size pieces. Add feta, a handful of sunflower seeds or walnuts, and some onion (optional) to the salad.